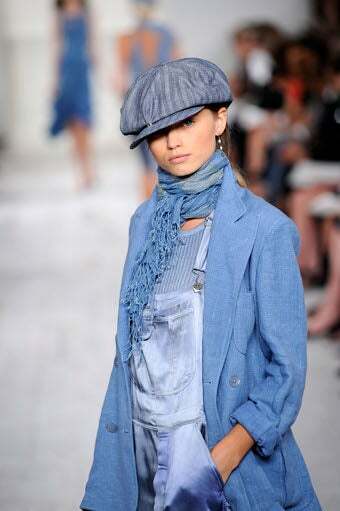 With his spring collection, Ralph Lauren hewed to his usual brand of classic Americana. Which apparently meant "Dorothea Lange" -meets-Newsies-with-a-dash-of-Blossom." ...or this sweet, simple tea dress. Or even this 40's-inflected lamé. Or "King of New York." Or even "liked-'Little House'-a-little-too-much 7th Grader." I love how Janet showed up in classic RL, and was presented with this parade of overalls. That said, she can rock a newsboy cap.